After my baby's big day last week, I've become so lazy (to blog) and been pre-occupied with other things. 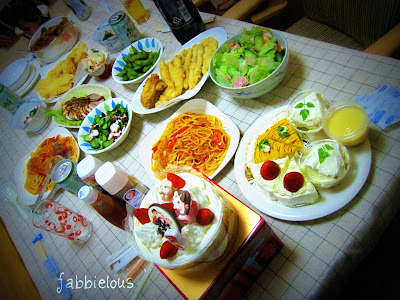 I never thought that it is really tiring to prepare a party in a house. Ive never done that by myself before. It's really different when you're living abroad, there's no one to depend on, unlike in our home in Philippines, we may have helpers around. My ever favorite Strawberry Short Cake from Fujiya. Looks Yummy! Well it was... and again--- I forgot my diet. How couldn't I? My FIL prepared almost all these foods (except the caldereta lol). The pasta and those chicken strips are the best! It was like we ate in a five star restaurant. Actually, my F I L is a retired Chef in one of the famous five star hotel in Japan, The Hotel Otani. Hubby and I actually planned to cook, but when my In-laws came, they took over. 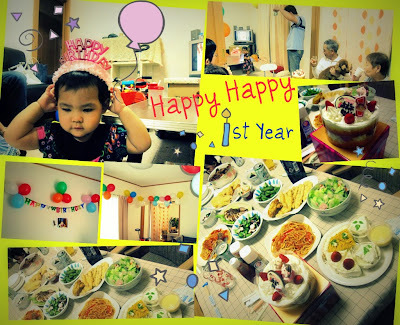 It was a simple and yet so Happy, intimate and an adorable first birthday celebration of our lil girl, only with our loveones. Wish I could have invited more but that would be definitely next time, with a bigger venue. Looking forward to celebrate her next Big day with you, my friends and loveones in the Philippines. swerte ka nga jan kasi you still have extra hands like your inlaws ...wow, bongga....chef pala FIL mo...no wonder, sarap ng food....yum yum yum! The cake is cute! :) Yeah organizing parties, small or big, can be tiring talaga. :) Happy birthday to your little girl. Happy bday ulit sa maganda at tabachinching na princess sa blogland hehehe... Mwah! Sarap ng cake! Want some Korean Side Dish? Come on over. wow! Obvious na super Happy ang Birthday ng iyong princess,daming food. Swerte mo naman to have a FIL na Chef. Belated Happy Birthday to Anzu! 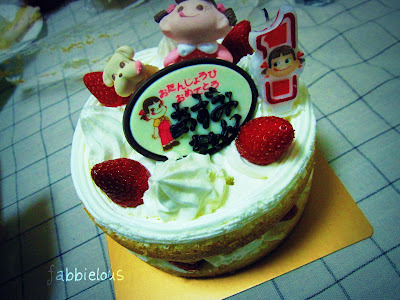 Awwww Anzu your cake is so pwetty like you!!!! Did you like it?? wow.. that's a sumptuous celebration.. yummm! the food..yes the foooooooooddddsss oh so yummy!!! 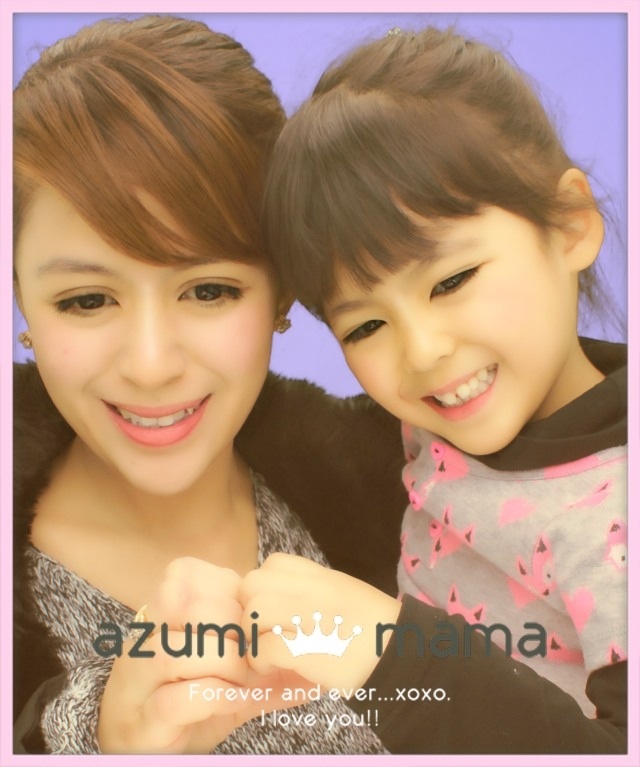 Happy Birthday to beautiful Azumi. You are blessed with so much love and attention darling angel. The cake is so beautiful you would be tempted not touch it to preserve its beauty, lol. And the food looks so delectable and yummy. No wonder they were prepared by your father in law who was a former chef of a 5 star hotel in Japan. I pray that God's bountiful blessings will be continued to pour on you and your family. Thanks for the post. God bless you always. Happy Birthday to your angel!! hi mami bams, belated happy birthday to your lil girl. sorry ngayon lang nakadalaw akoy kinapos na naman panahon sa pagbablog. lamo na sa flicr palang ubos na oras ko. nga pala wait mo gift ko for anzu sori at very late na darating am gonna mail it pa this week. sana magustuhan mo para kay baby anzu. take care always! Ang dami nman food ni baby Anzu, at ang cake parang Disney land my cartoon characters pa. Bongga, pinaghandaan talaga ni mommy at Daddy. yummy naman ng handa ni anzu. sana nakatikim ako ng luto mo mommy bamz. simple pero makikita mo na maraming pagmamahal. Very lucky baby kasi ikaw ang mommy. Super duper late na talaga ako sa mga events dito Imagine nung October pa 'to eh Nov. 1 na ngayon. Anyway,yan lang ang kahirapan while living in abroad lahat kilos mo you can't depend to any body & it's you yourself alone can depend on.Naku Bams mas maloloka ka pag nasa grades school na si Azumi chan dahil may friends na syang isasama sa bahay mo hehe.Be ready then my dear & ganba ganba for ganbaru shika nai hehe. MIL's still in the hospital & operation went well.Hindi pa ako nakakatapos sa pagaasikasi ka MIL here's hubby naman,suddenly woke me up in ther middle of dawn hayun sinugod ko sa emergency room ii ga itai daw balik kami ng Monday para sa complete check-up nya hopefully nothing really bad sa result ng test nya.Imagine i went to bed late na hehe past1 a.m na akong natuog then he woke me up @ 3.Then @8 a.m naman brought my dalagas to school for their basketball practice I'll pick them up in the afternoon kya sinaamantaa ko na ngayon ang blog hopping ko ehehe. Mah!Iitai koto wa ganbarimashoo neh!Ehehe parang guest blogger na ako nito napahaba comment ko.Mwah!